So…our original vacation plan was to go to Portland for a couple of days, then head to the Oregon coast for the rest of the week. When we saw the weather forecast for the Coast (45 mile an hour winds and rain for 4 days), we started rethinking this plan. As we checked out of our Portland hotel on Sunday, we made a last minute trip deal with Expedia and ended up in San Diego on Monday. 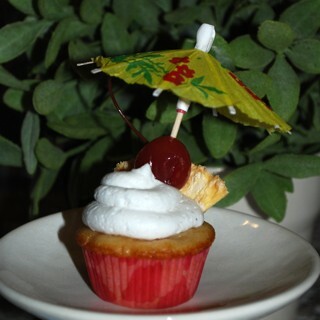 The weather was beautiful and San Diego is cupcake filled! 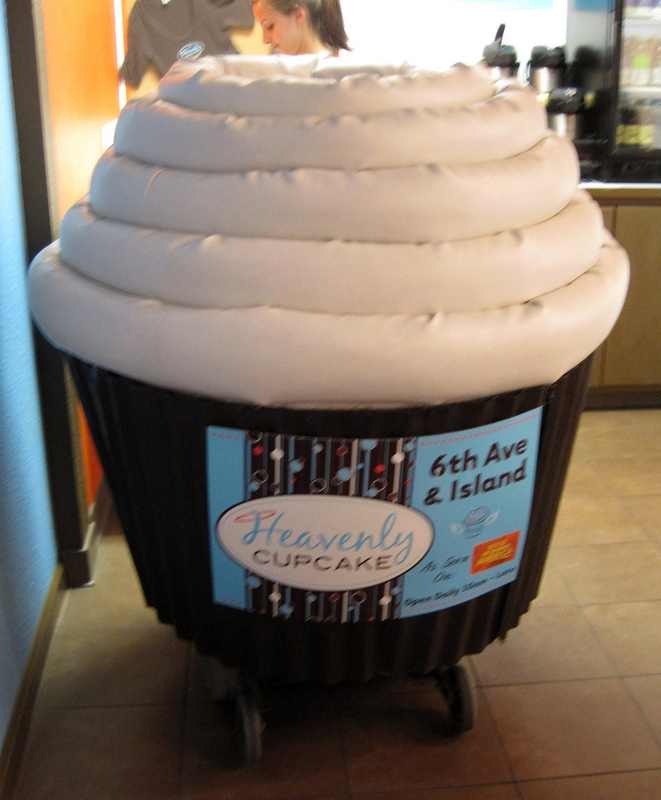 After a lovely dinner at Croce’s, we wandered over to Heavenly Cupcake for a treat. I thought the shop was extremely cute with an “urban loft” decor. There were a few tables and a couch or two. They are open late (10 pm during the week and 11:30 on the weekend) and bake on site. Also a plus: if you call in your order, they will bring it out to your car for you. A definite plus if street parking isn’t plentiful. They also have a little cupcake mobile which appears to be a fluffy cupcake on top of a Rascal scooter. 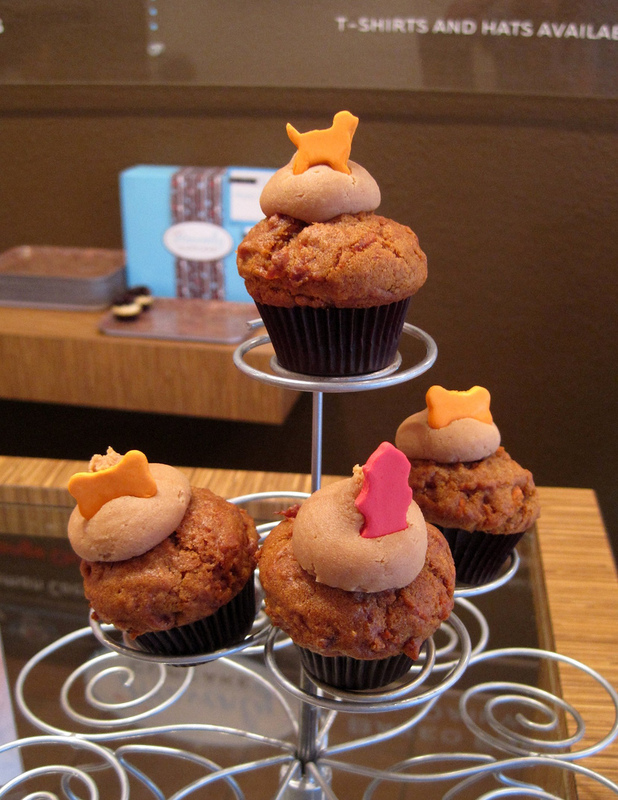 Another plus, especially if I had the puppies with me: they have a water bowl out front for the four legged patrons and sell pupcakes! The banana cake was very dense and chewy, more like banana bread than cake. It was extremely moist and had a lot of banana flavor. Excellent! The peanut butter icing was nutty and not overly sweet. It was garnished with crushed dried bananas which added a little crunch. Mr Shuck and I both loved this cupcake. Rating: ♥♥♥♥. I would go out of my way for one of these. 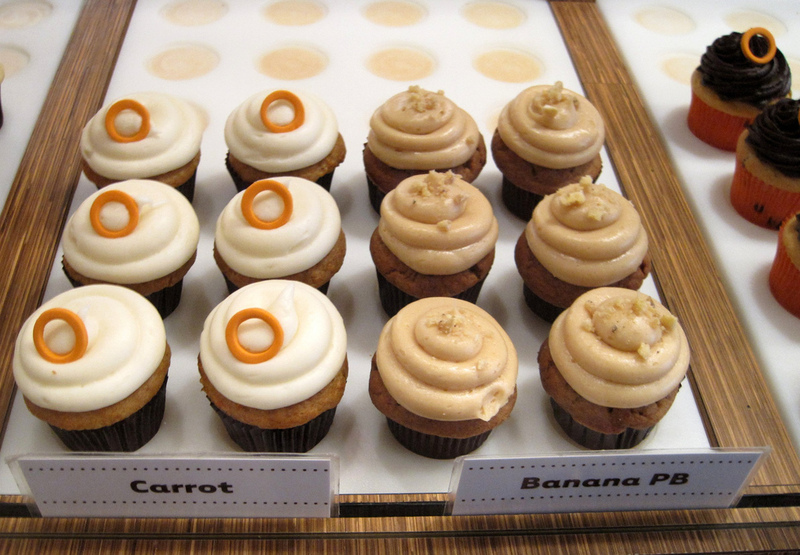 After the banana peanut butter, I was still wanting a little something… the only mini cupcakes that were available were the Orange Chip, their signature flavor. I don’t really like the combination of orange and chocolate, but I thought I’d give it a go anyway. As I brought it to my lips, I caught a scent of something familiar…Mr Shuck confirmed that it smelled like Froot Loops! A little taste…the cake tastes like Froot Loops! The cake was nice and moist, but I couldn’t get past the taste. The icing was creamy and rich. Together, it was like eating Froot Loops mixed with Cocoa Puffs. I probably wouldn’t try this one again. 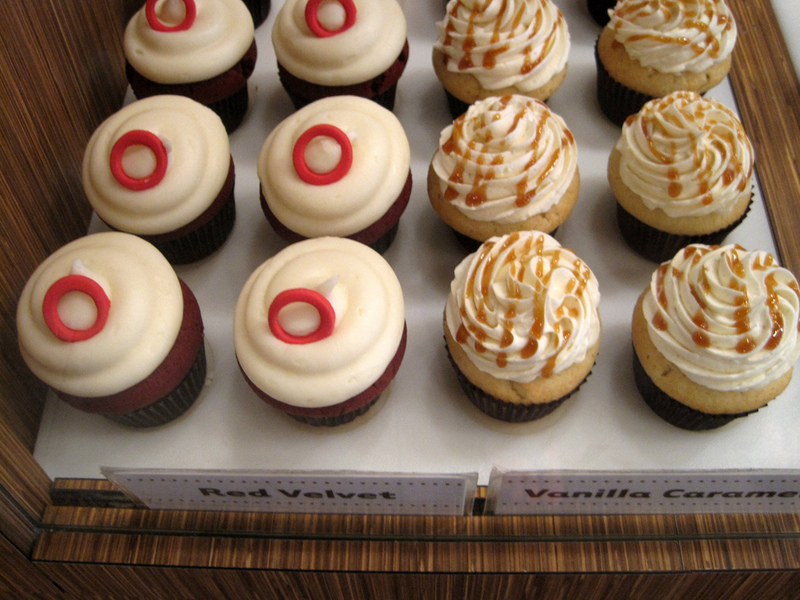 If I lived in San Diego, I’d probably have Heavenly Cupcake programmed in my cell phone. 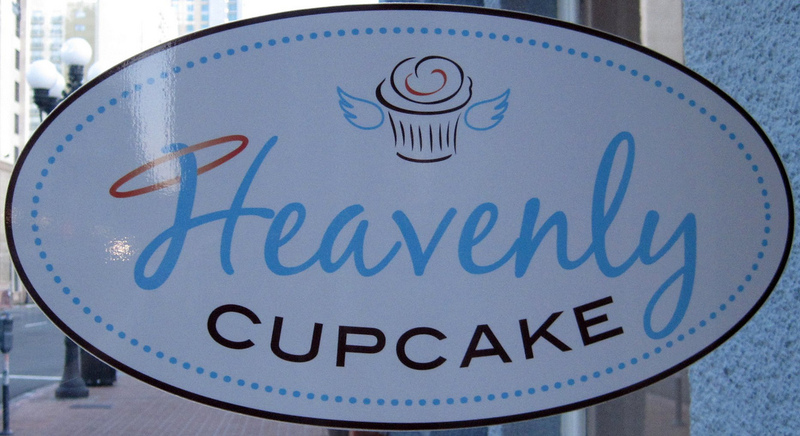 Granted I only have 2 cupcakes to judge by, but my first impression is “Heavenly”.